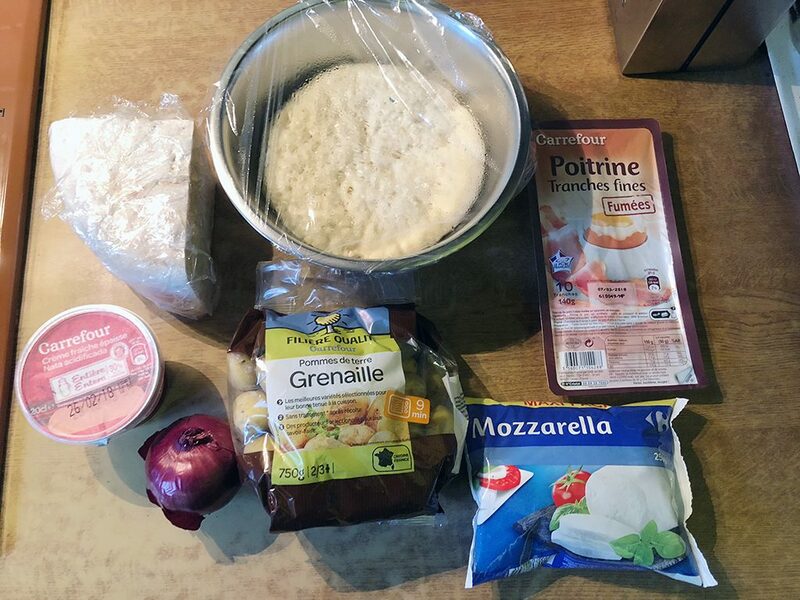 Start by making the pizza dough but you can use store-bought pizza dough if you like. You can find these in the refrigerated section of your supermarket. Slice the red onion into thin rings. Fill the pan with water and bring to a boil. Cook the small potatoes al-dente. Drain the potatoes using a sieve and let cool off for a bit. Slice the potatoes into two halves. Heat up a drizzle of olive oil into the skillet and cook the sliced potatoes until crispy. Drain the mozzarella cheese, then thinly slice. Slice the raclette cheese (when using a block of cheese) into thick and equal-sized square slices. Dust the counter top and rolling-pin with some flour. Roll out the dough into a round shape using a rolling-pin. Fold the edge of the pizza for about 1 centimeter inwards, to create a pizza with a slight upstanding edge. Flip the pizza once with the edges facing downwards. This prevents the edge from folding open or tearing during baking. The edge is needed to prevent most of the melted cheese from overflowing. Heat up the oven to a temperature of 180 degrees Celsius (or 356 Fahrenheit). Cover the baking tray with some greaseproof baking paper. 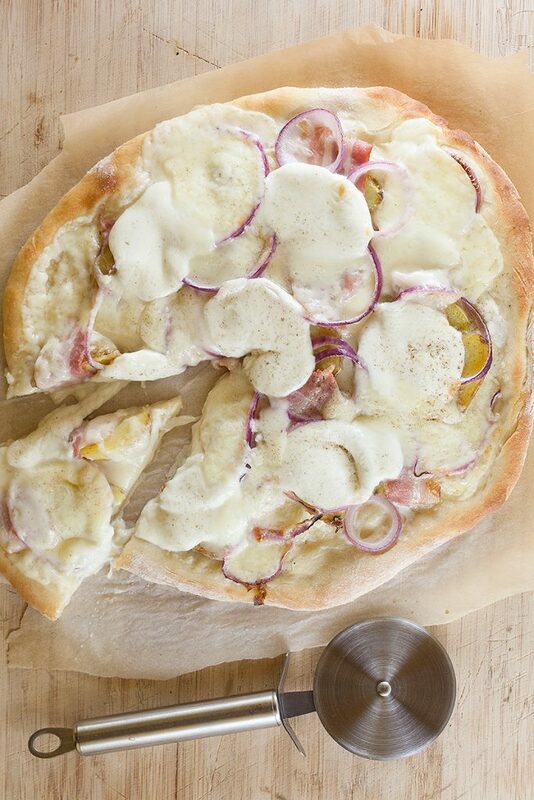 Using a tablespoon, divide crème fraîche over the bottom of the pizza. Then divide the baked potatoes and red onion rings. Place 4 – 5 slices of bacon on top of the potatoes. 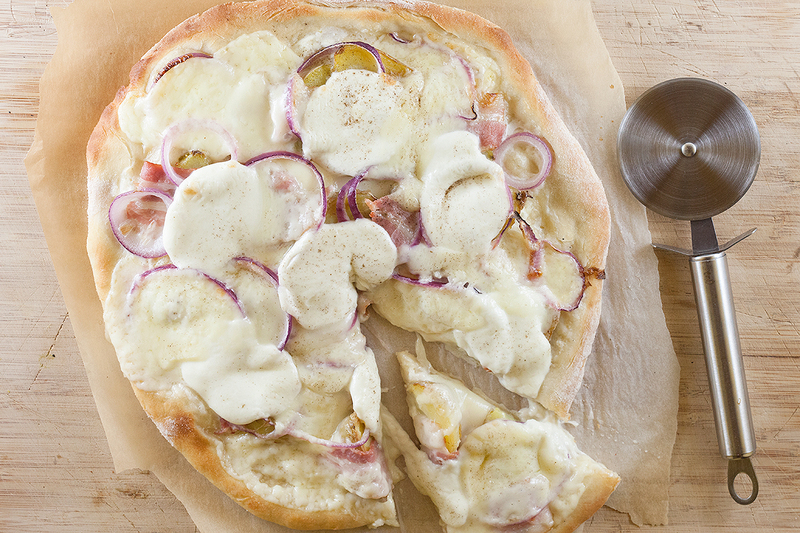 Divide 1 sliced mozzarella cheese and equal raclette cheese over the pizza. Season using salt and pepper. Bake the raclette pizza in about 10 minutes in the pre-heated oven, depending on how powerful the oven is. The cheese has to be melted completed and the pizza bottom has to be thoroughly baked. Divide the raclette pizza into equal slices, serve with a good glass of wine. Tip: carbonated drinks will make the cheese solidify in the stomach way faster.